« What happened at MediaCom’s Transformation Week 2018? Most businesses have a strategy for transformation, and if they don’t probably need one. When so much is changing and so fast it’s easy to assume that the old guard need clearing out. However it’s a mistake to assume that everything must change. If you lose perspective and all the experience from the team you are more likely to throw the baby out with the bath water. At recent judging of effectiveness awards several people commented that there was a great richness of material proving the value of old school branding practices. Transformation these days may well include restoring well worn paths to excellence that have made way to trendy tactics that still require rigorous proof of concept. In our industry we may be at risk of losing that perspective. Take your own team for example, does your team come close to matching the population profile by age? Most of us think the ad industry is ageist. 1 in 4 respondents to an industry survey last year said that they’d been told that they were too old for a new job. Age is another face of diversity. Some businesses don’t allow people to contribute if they don’t fit and don’t look the part, and age, like gender, class, sexuality, mental health, disability, and ethnicity is another aspect of exclusion. This is the real point. The problem is that some businesses are too homogeneous. A good culture allows for diversity. If everyone in the office is required to be laddish (and some of the team are not) then some people feel excluded and the result can be overall bad team dynamics. If everyone is required to be suited booted and formal, then that quells the fun and experimental spirit essential to a growth mentality. Management shouldn’t dictate. You can only create the environment that allows everyone to be themselves. Of course there’s a contract here between team members. You need everyone to deliver as required, to respect differences, to acknowledge each other’s strengths and weaknesses, and to partner for the strongest outcome. Earlier this summer The Marketing Society held a debate about ageism. The Marketing Society chief exec Gemma Greaves finished by saying: “I am not a fan of any isms”. Gemma is right. Ageism is yet another ugly face of forced conformity which stifles difference and limits potential. In today’s business world no one can afford to waste time on reinventing the wheel or energy on pretending to be anything other than themselves. True value is created when team members complement each other. In my blogs about gender I have pointed out the overwhelming disparity between the proportion of women making decisions, directing adverts or taking commercial photos and the proportion of women in the population and shopping decisions made by women. Disposable income sits disproportionately in the wallets of the over 50s, and this is growing. There is plenty of evidence that older people feel misrepresented in advertising comms. Is an equivalent disparity to blame? The debate about ageism in advertising is alive and well, although maybe a bit tired. It would perhaps like to have a cup of tea on the sofa and a nice afternoon nap. Whoops, there I go being ageist. 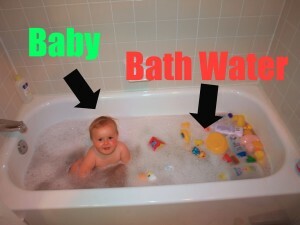 Never mind the baby, let’s not throw experience out with the bath water. This entry was posted on Monday, September 10th, 2018 at 11:33 am	and is filed under MediaComment. You can follow any responses to this entry through the RSS 2.0 feed. You can leave a response, or trackback from your own site.